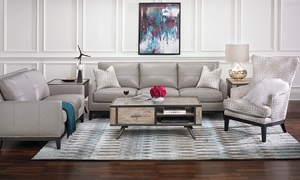 Exposed wood and heathered pewter fabric with welted detailing accentuate the architectural structural of this flare arm sofa. 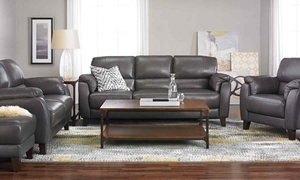 Traditional sofa with paneled roll arms, turned dark wood feet and nail head trim gets a fresh look with tan upholstery. 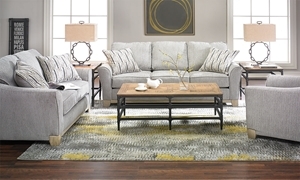 Crisply welted cushions and track arms in heathered grey fabric plus four eye-catching accent pillows make this simple sofa look chic. The classic Chesterfield gets a contemporary update with this handmade sofa featuring top-grain Italian leather seating. 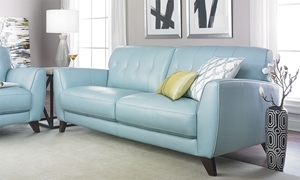 Contemporary sofa sports stylish seams and tufting along with paneled flare arms in eye-catching blue leather. 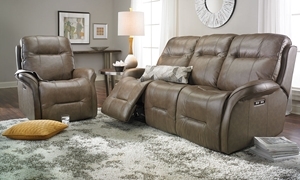 The sleek silhouette of this leather tight back sofa features narrow track arms, tapered dark wood feet and nail head trim. 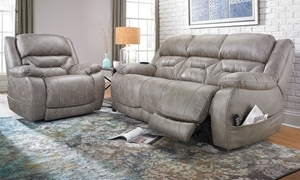 Contemporary sofa with padded arms and double-pillow back tailored in chic pewter leather. 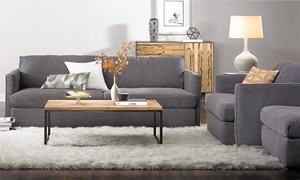 Modern 92-inch sofa is handmade in America with luxuriously deep cushions wrapped in a soft feather down blend. 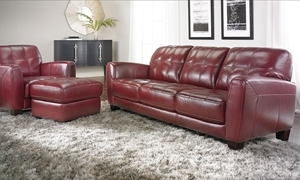 100% leather sofa flaunts a contemporary silhouette with slightly flared arms and biscuit stitching in a daring shade of red.